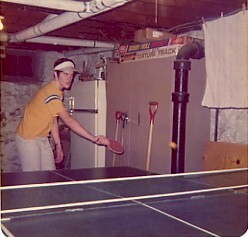 We spent many hours playing ping pong in the cellar during the 70's. This looks like perfect conditions, with sheets and towels hanging to prevent errant shots from entering the junk-filled nooks and crannies under the house. I'm not sure why Rich needed the visor; must have been the bare lightbulb hanging over the table.